Leftbank offers a new and contemporary style restaurant on the banks of the Thames. The restaurant has been designed around an aquatic theme, with striking features including three stunning aquariums and an open seafood bar. Interior designers, Such� Design, were appointed to undertake the complete renovation of the riverside restaurant at the Runnymede Hotel & Spa in Egham. The transformation from a traditional to a more dramatic interior and architectural design positions Leftbank as the first of its kind in the Home Counties. 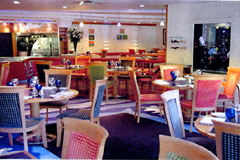 The 90-seat restaurant has been extended to 140 covers and has its own separate entrance. The restaurant has been designed around an aquatic theme, with striking features including three stunning aquariums and an open seafood bar, complemented by vibrant and neutral colours to enhance its riverside setting. The Mediterranean-inspired menu created by Executive Chef, Laurence Curtis, and Sous Chef, Nick Hebditch, provides a choice of carefully chosen classic and contemporary dishes, accompanied by an imaginative, extensive and affordable wine list. The Mediterranean-inspired menu provides a choice of carefully chosen classic and contemporary dishes, accompanied by an imaginative, extensive and affordable wine list.